Sarah Keyes is an Adirondack Mountain Runner. She found herself running mountains to escape life, but also to enjoy it. While highly successful (re: 1st place at Broken Arrow SkyRace; 2016 US Skyrunning VK and Ultra Division Champion, 4th at 2017 World Snowshoe Championships), she wouldn't call herself competitive. In between some nursing shifts, Sarah runs for La Sportiva and Julbo. 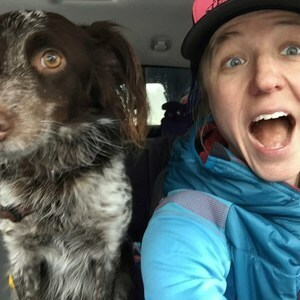 If you find her in the mountains, with her truck and her dog Mocha, she's happy to share a running story, but more likely to ask you for one of yours. Sarah Keyes has been a guest on 1 episode.